The objective of this book is two – fold: to acquaint the visitor with the history, culture, long tradition, lores and the beauty of this captivating land called “Hellas / Greece”, on the other hand, to provide relevant information in order to make this tour as exciting, exhilarating, enjoyable and as worry-free as possible. 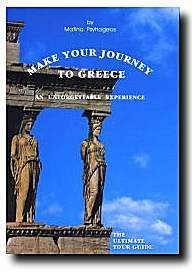 It has been designed to accommodate by presenting facts and recommendations necessary to anyone visiting a foreign country (i.e., a summary of Greece’s long history, everything needed to communicate in the native tongue and all that is required for a wonderful, indeed unforgettableBon voyage! journey). …You are planning to visit Greece. That is great! A most fascinating and splendid experience awaits you. Come and live not only the glory that was Greece, but also the infinite variety of the landscape ranging: from snowcapped rugged mountains, to sun-drenched idyllic shores; From the beauty and serenity of the Aegean and Ionian Seas – where over one thousand five hundred incredibly beautiful islands are scattered – to the forested mountains, icy lakes and tumbling rivers of Northern Greece. The land is blessed with temperate climate, sunshine and the beautiful blue sky of the Mediterranean. All that, intertwined with an unsurpassed history, culture and tradition…. …Do not miss (if you have the chance) a performance at the Odeon of Herod Atticus in Athens. It is an experience to be treasured. Imagine this: you’re listening to a modern/classical symphony or watching an ancient tragedy, performed – in a 2500 year old amphitheater-by first-class actors, while you’re looking-up towards the Monument of Monuments the Parthenon and the marvel of the Acropolis. That is indeed one of the most up-lifting lifetime adventures.